South Bahia Beaches SouthBahia.net - South Bahia Beaches - Sun, sea, nature and a lot of fun! Nearly everyone enjoys the beauty and tranquility of a tropical paradise. Statuesque palm trees, vibrant wildlife, stunning views of the ocean, magnificent and blue. And with each passing breeze, all worries disappear into the fresh open air. Now imagine if this paradise also came with a rich cultural history. South Bahia is that place and your only problem during your stay will be not wanting to leave. This village is one of South Bahia's favorite vacation spots; not only for its stunning views and charming qualities but for its lack of roads or car traffic. Experience a true island feeling by walking along the carved pathways surrounded by hill-topped jungle, visit the nearby beaches for sun and relaxation, then dine at the many international eateries for traditional Bahian fare and other culinary delights. There are few places in the world, pure and untouched where tourism is on the rise yet it's astonishing how the beautiful island of Boipeba remains an oasis in the middle of it all. Spend a few days in this historic town which embodies the essence of southern Bahian culture. Camamu was constructed in two levels: the upper with remarkable churches and colonial homes and the lower level serving as the industrial hub for commerce. Take a magical boat ride around the third largest bay in Bahia and experience the unique beauty of each surrounding island. Barra Grande is a small beach village that has managed to hold onto its charm all of these years. Walk barefoot on pristine beaches surrounded by breathtaking beauty then ride through the rest of the Península and visit the various boutiques and international restaurants on the island. One of South Bahia's favorite vacation and surf spots, Itacaré offers contemporary culture combined with traditional Bahian living. Tranquil white sand beaches surrounded by the Atlantic Forests plus a lively town center for party-goers and cultural enthusiasts. If you want to experience the essence of being bahian, Serra Grande is the place! A cozy village, tranquil and peaceful, surrounded by Atlantic Forest facing 13 miles (22 km) of beautiful white sand beach. This spectacular gateway to the Cocoa Coast has more than one tale to tell. A historical city known for its reputable authors and colonial buildings, Ilhéus is a place to soak up both culture and sunshine. In addition to the town's fairytale setting, nearby towns such as Olivença offers high-class surf and beach hang. Salvador is a hot bed of excitement, culture, music and art. All of this surrounded by a gorgeous coastline with beaches for fishermen, party goers, and families alike. If you enjoy urban dwellings and architecture then Salvador will keep you busy. If you love dancing in the streets, eating spicy food or engaging in a culture that put the soul in Brazil, Salvador should be your next stop! Salvador's Deputado Luis Eduardo Magalhães International Airport (SSA) is the main Bahian airport. Flights from all over the country arrive here as well as flights from the rest of South America, Europe and the U.S. Flight companies like TAP (Lisbon), Air Europa (Madrid) and Air Condor (Frankfurt) are the main connections with Salvador. Flight companies like American Airlines (Miami), Aerolineas Argentinas (Buenos Aires) and Air Europa (Santiago) are the main connections with Salvador. 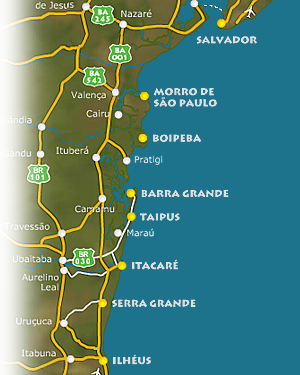 Flight companies like TAM, Gol, Avianca, Azul Linhas Aéreas and Passaredo connect the rest of Brazil with the Bahian capital.